We design products that introduce game-changing capabilities for life science and healthcare applications. Here’s what’s next! High-throughput screening (HTS) mainly has been performed with traditional activity screens that do not provide the kinetics or affinity data that can substantially increase accuracy and quality in our understanding of target-drug interactions. Existing label-free technologies such as optical biosensors and mass spectrometry have scrambled to fill the pressing need for direct detection in the screening process, but are hampered by the lack of ability to sense in solvents and detergents which are requirements for low molecular weight (LMW) compounds. They also lack the ability to reach the throughput provided by classical activity screens without considerable increases in cost and a complete transformation of current processes. Nanomedical Diagnostics introduces a breakthrough electrical label-free graphene biosensor that provides distinct advantages over the optical or magnetic techniques of the past. 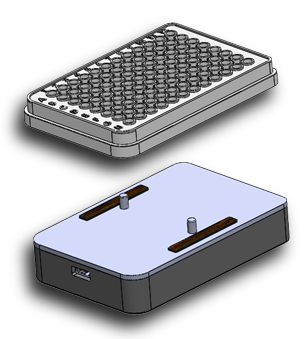 As a small device, several biosensors can fit in each well of a standard SBS footprint microtiter plate, enabling seamless integration of the technology into existing HTS processes, something no current direct measurement technique can achieve. In conjunction with standard liquid handlers used for HTS, the technology can support over 20,000 measurements an hour when implemented with a 1536-well plate design configuration. More crucially, because the biosensor uses an electrical technique rather than an optical one, it is unaffected by complex samples that include solvents and detergents. This, combined with an unprecedented 11-log dynamic range and the ability to detect with a minuscule amount of sample, enables direct measurement of LMW compounds in DMSO, making kinetic characterization of entire fragment libraries in a matter of hours possible for the first time. This electrical-based biosensor uses a proprietary label-free technique called Field Effect Biosensing (FEB) to measure biomolecular interactions. Field effect biosensors are built with graphene, a material lauded for its excellent electrical conductivity, high surface area, and unique biocompatibility. In academic lab studies, graphene biosensors have pushed existing linear detection ranges and sensitivity limits, and most notably, have shown the ability to measure a large range of biochemical interactions from detecting DNA SNPs to small molecules binding to GPCRs. FEB measures the current across a graphene biosensor functionalized with immobilized biomolecular targets. Any interaction or binding that occurs with the target causes a change in conductance that is monitored in real-time. Only molecules binding to or dissociating from the biosensor surface cause a change in conductance. Unbound molecules, crude media, or solvents that might interfere with optics do not affect the conductance reading, enabling a large reduction in background noise and accurate measurements in complex samples. Agile R200 is slated to launch early 2019. Contact us to learn more. We’re applying our graphene biosensor technology to develop an improved diagnostic test for the Lyme disease bacteria as well as the body’s immune response, to deliver results as early as three days post-infection and possibly confirm eradiation of the disease.